We specialize in strategic insights through qualitative research and analysis, persona development, consumer segmentation, trend research and application, brand development and design. We combine our deep understanding of innovation, branding and insights with creative solutions, resulting in clear, actionable brand strategies rooted in a deep understanding of the consumer. Our proven track record includes identifying and activating more than $1 Billion in new streams of revenue for clients. 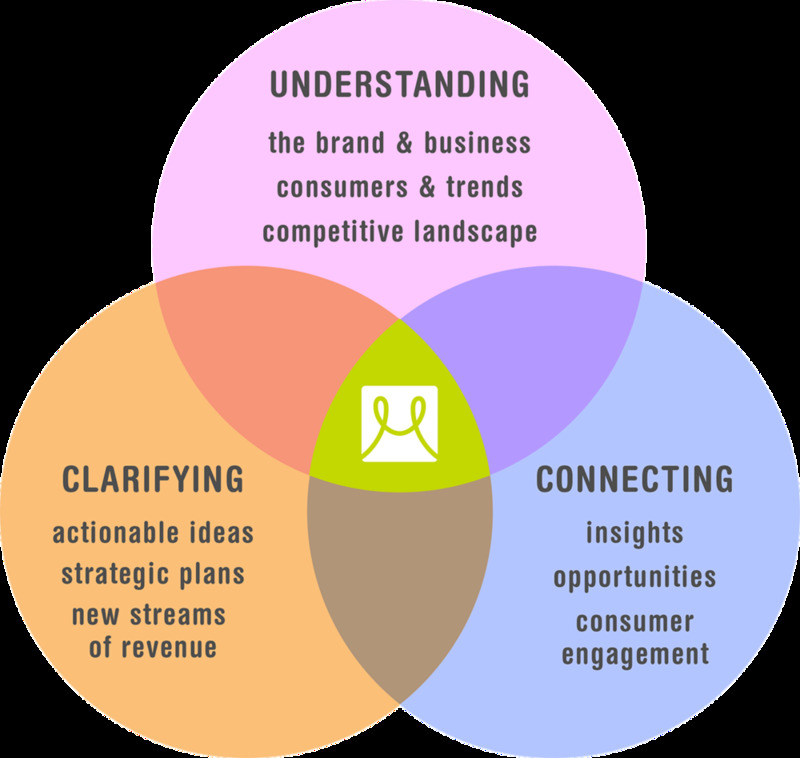 We specialize in helping brands understand their consumer, competition and category dynamics. We identify and decode the macro trends affecting your business to help ensure you don’t miss the mark. We bring clarity to your brand vision and connect the unseen dots so you have a clear path for successful growth. Every client is different, so we tailor our approach for each project using the tools that fit best and will allow us to uncover the information necessary to help your brand succeed. We bring a fresh perspective, breadth of knowledge and a collaborative approach to problem solving that will help you see things in a new light. And our deliverables are concise, visually compelling and easily understood with rich insights and actionable implications. And we won't leave you hanging. We can work closely with you to execute your brand or marketing strategy, implementing the change that is vital for your brand growth. We are flexible and nimble, and can work as a seamless extension of your team or take on full management and execution of any project, large or small. We work closely with our clients to gain a deep understanding of their business, acting as partners, trusted advisors and sounding boards. We help solve problems, generate new ideas, spread the word and create meaningful consumer engagements. With the diverse experience we've gained working with many of the world's great brands over the past 17+ years, we are currently devoted to clients in food & beverage, consumer goods, and hospitality. We've also found a particular passion for the healthcare space, where we've been working with some great partners to better understand the needs of their consumers (aka patients) and to successfully stay ahead in their fast-changing world. We're a collective of like-minded, strategic and creative individuals focused on great brand experiences. Our dynamic process allows us to assemble the right team for each project, with one point of contact throughout for consistency in communication, vision and follow-through. She then joined Nike's equipment division, where she played a significant role in launching the Timing, Vision and Tech Lab businesses. At Nike, Jennifer was responsible for color forecasting, trends and consumer insights for the product design and marketing teams. Her breadth of experience in advertising, marketing, graphic design and product development provide an ideal foundation for Muse, which she launched in 2000. Benton joined Muse in 2002, bringing his aptitude for analyzing complex business challenges and developing clear, comprehensive creative strategies that are effective and visually compelling. Benton's skills and experience bring visual clarity and life to the information in our reports. Kim Brechin, a core strategic partner, brings more than 15 years of expertise as a senior level engagement expert, specializing in communications strategy, outreach, brand communications, reputation management and sponsorships. She also has extensive experience in social media programs and planning, notably helping to define and implement brands that are recognized pioneers in social and digital media strategy, such as Kaiser Permanente, Nike, Williams-Sonoma and Starwood. Kim's work has led to a recent appointment to a chair position on the prestigious HBR Council for Social Trends. Kim adds a new dimension to Muse's work through her unbridled energy, passion for storytelling and ability to develop and implement powerful communications strategies across multiple platforms. Working as a tightly integrated team, Muse brings fresh insights and innovative thinking to businesses worldwide. all site content © muse. all rights reserved.